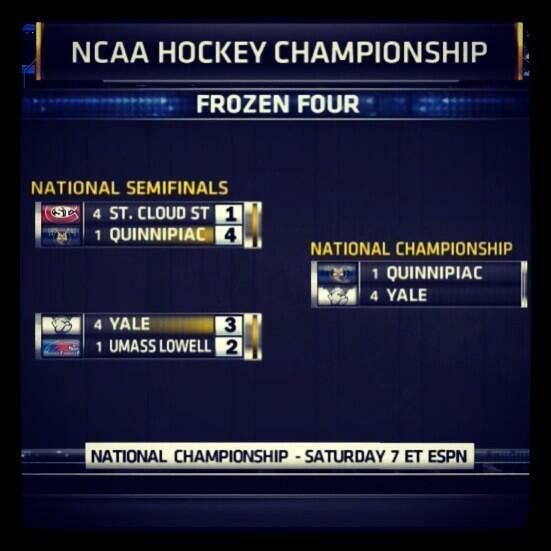 QU Is just 1 win away from a National Title! I sat among a sparse crowd with my pad, pen, and tape recorder. Yes, an actual tape recorder…there were no apps then either. I was stationed inside the cold, unimpressive facility that reeked of high school athletics. Eleven years later, everything’s changed. In 2012-2013, the Bobcats posted a 17-2-3 ECAC Conference record, tallied a 21-game unbeaten streak from November to February, and finished the season ranked #1 in the nation. Now, Quinnipiac sits just one victory shy of claiming an NCAA Division I National Championship. The little known school from Hamden, CT, my alma mater, steamrolled through the Frozen Four Tournament to land a spot in the final game, to be played tonight in Pittsburgh against rival Yale (QU has already beaten Yale 3 times this season). It’s the sort of high-level game I could only dream about as a freshman. Like every sports fan at Quinnipiac, I own the t-shirt that reads: “Quinnipiac Football – Undefeated Since 1929.” Many may not realize though, the team hasn’t won a game since 1929 either. The made up football team is a campus-wide joke. There is no bigger hockey program in the country than Quinnipiac’s. They are drawing national recognition and making current students, and alumni like myself, proud to be Bobcats and no longer envious of other big-time sports programs. The Big-Time Bobcats are only one win away from a National Championship. I saw Bob Knight Cry. I also saw him scream his way through an obscenity-laced tirade – but that’s what you’d expect from the legendarily intense Hall of Fame basketball coach. Yes, I also got a rare look at the compassionate side of a man who once threw a chair across the court to express his anger. 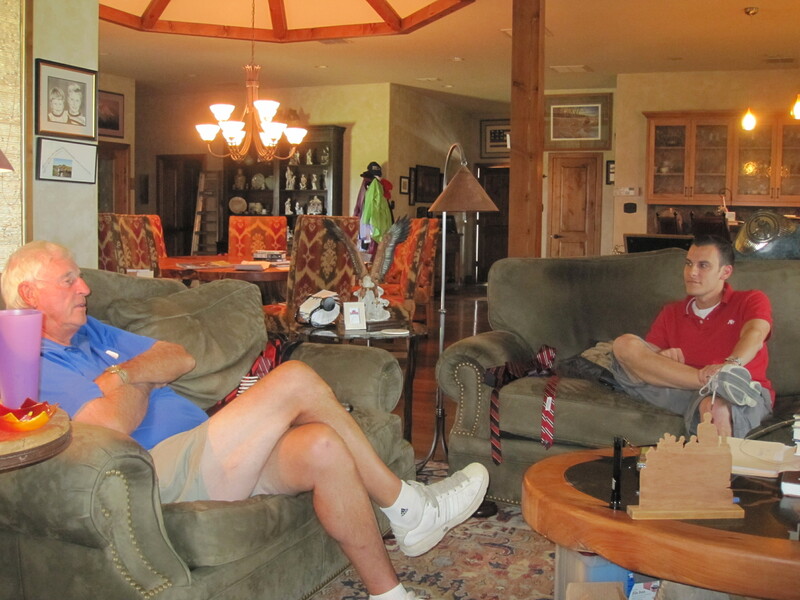 I spent a full week with Coach Knight in his home. 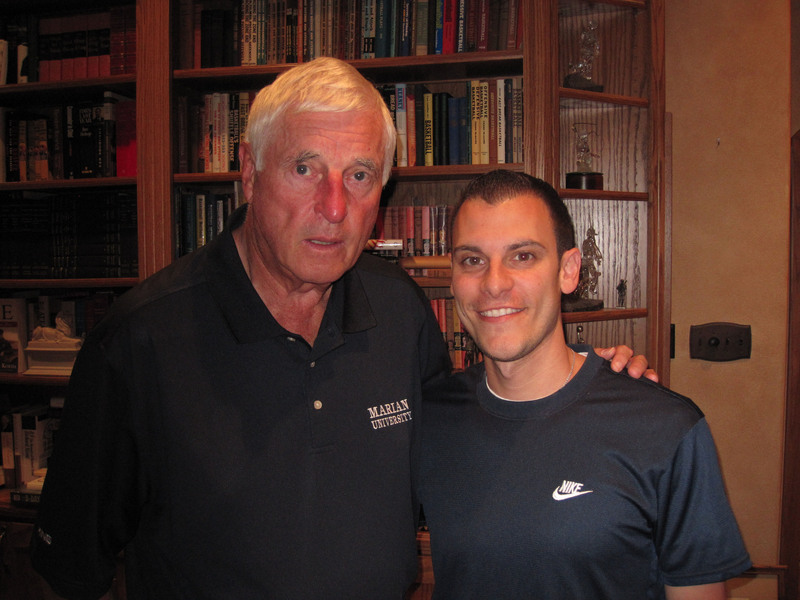 I spent a week down in Lubbock, Texas with Coach Knight this month. I was stationed at Knight’s house with a team of Steiner Sports personnel rummaging through his massive collection of sports memorabilia, awards, and NCAA Championship rings. The unique items we discovered will be part of a Steiner Sports auction beginning October 8, 2012. It was an unbelievable opportunity for exclusive face time with one of the most renowned coaches in the history of basketball. But then, during a private moment, I saw the man momentarily let his guard down. It was astonishing. He was signing some pieces from his collection when he began to tell me another anecdote from his past – Coach has more stories than a library – but this one had a different feel to it. Unlike his other tales, there was no fury in his voice and no sarcasm in his delivery this time. Known for always having his guns blazing, this time, the resident of Lubbock, Texas held his fire. He was recounting the story of Landon Turner, an Indiana University forward who played for Knight from 1978-1981. An All American in High School, Turner had his choice of playing at just about any top college basketball program in the country. He chose Indiana, and Coach Knight. Knight told me how instrumental Turner was in his 1979 NIT Championship, and their 1981 National Title run. Earlier in 1981, Knight mentioned how he had spent some time in Knight’s “dog house,” (who hasn’t?) but won him over with extraordinary play down the stretch that resulted in the National Championship for Indiana. Knight had more stories than a library – each one better than the last. Knight was beaming when he told me how proud he was of Turner, and how bright his future was going to be at the next level, the NBA. Then, Coach’s demeanor changed drastically. He started speaking quietly, and got misty-eyed, as he continued his story. You see, just four months after winning the 1981 National Championship, Turner was paralyzed, from the chest down, after suffering through a nasty car accident. So much hard work and dedication, and in an instant, Turner’s career on the basketball court was over. Knight was heart-broken. He was devastated by the sudden tragedy. He sat slouched in his chair, and looked up at the ceiling as he recounted the story. Though helpless, Knight told me, he felt he had to do something to honor his player. On June 29, 1982, Knight got his wish. With the final pick of the draft – pick number 21 in round 10, Auerbach selected Landon Turner out of Indiana University. It was a poignant gesture to commemorate the collegiate career Turner had in Bloomington. I sat there speechless. I had never heard the story before, and to hear Coach Knight tell it with emotion and sincerity left me stunned. Knight quickly shook it off and got back to autographing pieces of his collection. Moments later, he was back to his normal self, using colorful language to describe just about anything he could. That’s what I expected when I first flew out to Lubbock to meet with him. I knew I’d get insider access to his home, I never imagined I’d get such a close look behind his emotional steel curtain as well. I never thought I’d see Bob Knight cry.